W-299 You can change outfits & poses as you like free. Customized Wedding bobbleheads Construction Groom And Cello Bride.This customized wedding couple bobbleheads depicts the groom wearing a black suit and bow tie, and tools around his waist, while the bride wearing a simple wedding gown with a cello.This customized hand in hand couple bobbleheads can mean something for the couple who love playing the cello. 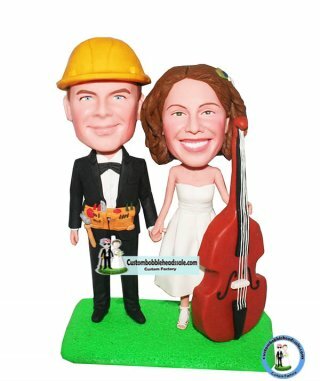 Also a special wedding cake topper for them. Our artists will not fail you!